Welcome to DLA Siberian Huskies Adult Dogs! of energy! He loves his boot! Here are Thor's puppy pictures! Tila is a black and white female with 2 gorgeous blue eyes! Misha is a wolf gray and tan female with 2 gorgeous blue eyes! Xena is out of Livasys Link and Livasys Tila's litter. you want in a husky! Rika's pedigree goes back to Kodiak Thunder Blue! "Tux" is an absolutely amazing stud and when I say stud, I mean just that. 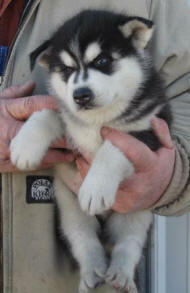 He is probably one of the best all around Siberian huskies around! Tux is gentle and so well mannered. His build and coat are perfect. Just look at his pictures. You can absolutely tell he is the son of a champion! Siberian Husky puppies are the most loving dogs around. They do not make good guard dogs, as everyone is their friend. In order to raise a husky, you need a large, fenced in yard! They will run off if allowed to go free. believe me, there is a lot of hair! 1, 2, 3....hide and seek! No one will catch me! !